Accountant and insolvency expert Vanessa Foran (her off the telly!) kindly agreed to have ‘look see’ through RTÉ’s recently published Annual Report for 2016. 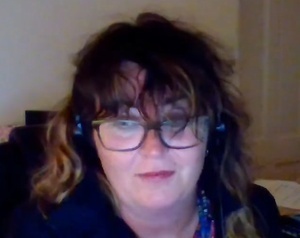 What she saw will make you TORCH your remote. If anyone was watching Broadsheet on the Telly last Thursday night you might remember I had a look at the RTE Annual Report for Broadsheet, but unfortunately we didn’t get to it on the broadcast. I would like to fill you in on two particular areas that got my attention: The distribution of the Licence Fee income and payments to the directors. First, a look at allocation of the licence fee. 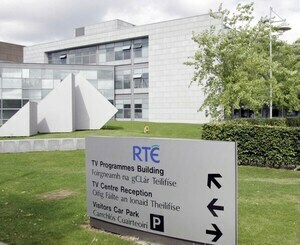 In 2016, Licence Fee Income was reported as €179.1 million. 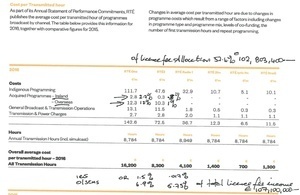 Of that 57.4% [€102,803,400] was allocated to television (RTÉ 1 & 2). Of the €25.7 million allocated to private providers, 14% of total taxpayers’ finance, €22.6 million of it is paid to suppliers outside of our national broadcaster’s jurisdiction or, if you like, Tax Take area. That’s €22.6 million = 12.6 % of the Irish taxpayers’ 2016 contribution to our national broadcaster. Money that could go to up and coming screen writers, pilots, animation development, wildlife programming – all sorts of Irish stuff. It might even introduce some new faces to the RTÉ canteen, which I feel confident and competent enough to assume is something we would all like to see. As a viewer myself, and a taxpayer, I would prefer to see more of this, the above, even if it is awful, than see RTÉ pay for and host repeats of shows I can already get on ITV or TLC, or YouTube. For comparison, as that’s a requirement of any accountant’s report, the sum spent by our national broadcaster on acquiring programming from Irish suppliers was €3.1 million (1.7%)… €3.1m v €22.6m…1.7% v 12.6%. [Note: If information that this money was spent on getting into the Rio Olympics and other events, becomes available, then I will reverse my opinion but, as I write this, I am of the opinion that sporting events and such are in the RTÉ Sports and Current Affairs allocations]. Meanwhile, the report’s Governance Section contains the directors’ emoluments…. RTÉ Authority chair Moya Doherty is paid twice what her fellow directors get paid. Is Ms Doherty worth 100% more than anyone else? Argue that among yourselves but I would have to state, without any apology, that €3,100 plus mileage etc, per meeting, is outrageous. And it’s all multiplied by 10. 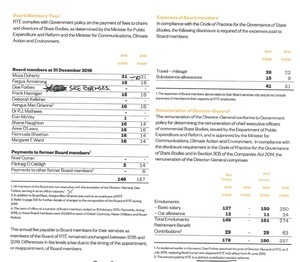 The sum of €41,000 is also recorded for mileage and subsistence (up ten grand from previous) for directors. This is €41,000 of expenses. Interestingly, there is good attendance at meetings, but with this kind of stipend per meeting why wouldn’t there be? Charities and your local credit unions are forbidden from paying their directors any fees so why should RTÉ? Why, in receipt of €179,100,000 from taxpayers, should RTÉ be allowed pay a multi-millionaire €3,100 to attend a meeting? And, repeat it, month after month for 10 meetings a year? A hospital would never get away with that. Also, Aengus MacGrianna is the staff representative on the board, and gets this €1,600 (aka a €16k annual top-up.) Why is this coming from RTÉ? Why isn’t his union paying it? Perhaps the Broadsheet commentariat could decide the answer to this and my other questions between yourselves. But do let me know the outcome. Posted in Misc and tagged RTE, Vanessa Foran at 4:53 pm on July 25, 2017 by Vanessa Foran.